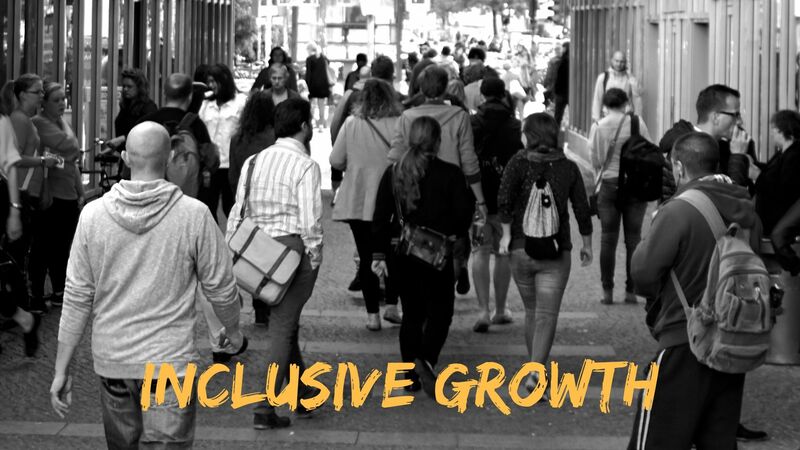 Inclusive Growth in India is a wider concept that creates equal opportunities for economic participants during economic growth, with benefits for all sections of the society. Our government has devoted a lot of time and energy to focusing on inclusive growth. Inclusive growth really implies a bottom-up rather than a top-down approach. The idea is not to create more billionaires, but to make millions of people to move at next level of economic pyramid. So, this means that we must increase our spending in rural areas, we must build roads, improve skills, education, agriculture, electrification and connectivity. The government needs to invest more in rural areas; As their income increases, even prosperity increases, that leads to the demand for new products and services. Many people see rural India as a market, but we should see an opportunity to increase their income; As soon as we increase their income, a market will automatically be created, but the government must first meet their basic needs such as food, clothing, housing and education, safety, water, health, employment and business opportunities. There are 3 important issues and challenges in achieving inclusive growth in India. We have to decrease this disparity, we can never get rid of it but we can narrow it substantially. We have 550 million young people below 25 age, we have ready work force for the world, everything we do today must focus on this population, we need to provide them nutrition food, skills and job opportunities to grow. We have to create 10-15 million jobs every year but it is difficult task for only Government, so we have to create more entrepreneurs in rural areas. Expansion is happening every day in the developing country like India, but perhaps not happening in the pace we would like. We have roads but we need more roads likewise we need to expand energy, infrastructure, facilities, etc. Leaving of our top 5 or 10% quality of our education, our services, our governance, is really not that so great, we must collectively work towards improving quality in everywhere. We need to make sure that the poorest to the poorer can be indeed get the best education, health, jobs and other facilities. We must focus on affordability, scalability and sustainability. We have a large potential market for which we can find affordable solutions. And more, we must protect our environment, the policies put in place by the government that must not harm the environment, because we must protect for the next generations, otherwise it becomes selfish and people cannot live in these conditions. Inclusiveness stands on the main four pillars through the GDP growth, these following factors are the key to frame policies. The main objective of inclusive growth is to generate opportunities through which the standard of living will automatically increase. Therefore, when formulating the policy and at the time of implementation, the creation of opportunities should not only focus on poor, otherwise we cannot achieve inclusiveness. Even though the employment opportunities created for the people, they should have the skill set of work which they actually needed. Only by providing education and training we can increase their capabilities in turn helps to be a part of the country’s economy which leads to live a better life. Inclusive access guarantees that everyone can participate, and take control of the activities and services provided by the government. Everyone means parents, youth, the elderly people, people with disabilities, people with having less mobility or people who do not understand the world around them. Example: Financial access, Digital access, etc. Security is also an important policy area in inclusive growth. Growth must also guarantee the safety of people by reducing corruption, providing quality health services, providing insurance to people, so that, after his death or retirement his family should be safeguarded by generating income for women’s safety, children education, etc. In the same way, many security measures must be taken into account when developing a policy.